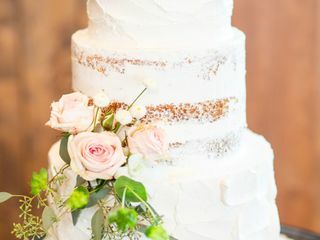 We had such an excellent experience with Fresh Baked, from the tasting to the very last bite on our wedding day! Sarah was professional, flexible and eager to please us. 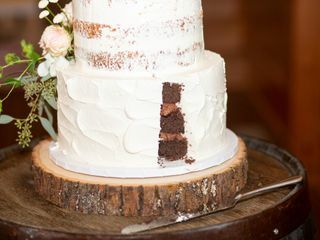 We were so impressed by the look and taste of our cake and it was everything we had hoped for on our wedding day! We can't wait for our year anniversary to bring out the Red Velvet topper!!! Highly recommend Fresh Baked! Sarah was so easy to work with for our wedding cake! The complimentary cake tasting was delicious which only made our decision harder, haha. She had amazing flavors! And her designs are gorgeous. She also provides delivery services and offers to loan cake stands out for no additional charge if you are able to return it the next business day. 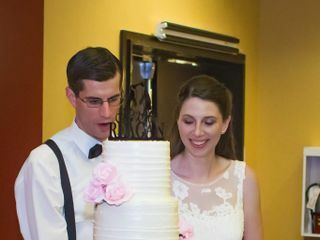 Sarah exceeded our expectations with an absolutely gorgeous wedding cake and super cute grooms cake! The flavor selections are vast and SO delicious! We ordered two custom cakes for our wedding and both were amazing. We were particularly impressed with the hand-painted details on the groom's cake! We received many compliments on both the artistry and flavor of both cakes. You can't go wrong with Fresh Baked! 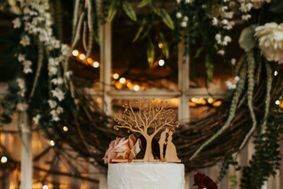 Sarah was INCREDIBLE to work with and designed the PERFECT wedding cake for our special day! 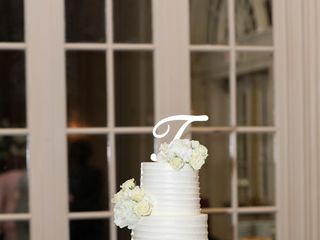 Sarah was very flexible with our tight schedule and made the cake selection process so easy and fun! 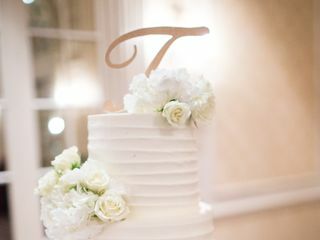 We thoroughly enjoyed the variety of her cake flavors and the simplicity of her pricing. Her confidence was a pleasing sign of her experience, and the final product was exactly what we had hoped for! Numerous compliments from the guests about our cake and we had the perfect amount for everyone to try multiple flavors without running out. We are so pleased with Fresh Baked and will recommend Sarah to anyone we know getting married in the Roanoke Valley! Sarah and her team, were truly amazing! Sarah helped us with every detail with the cake, and had lots of options for us! She even checked in with us to make sure it was still the design of the cake we wanted, and triple checked with us about how many people would be there! The cake was delicious and everyone had nothing but compliments from the cake! Sarah and her team at Fresh Baked Bakery are amazing and I highly recommend them!!!! YOU CANNOT GO WRONG WITH SARAH & FRESH BAKED! Working with Sarah was amazing. She was accommodating from the very beginning (fitting us in for a tasting) and all the way through the process. She made the out of town partnership painless and easy. I am the type of person who asks a LOT of questions all through the process. Sarah is very responsive and never once made it seem as though my questions were a bother. I came in to her shop with very specific ideas of what I wanted for a wedding cake and she delivered 100%! My cake was the most beautiful cake I have ever seen and my guests raved about the flavors! Sarah’s cake and icing (EVEN FONDANT, PEOPLE) are delicious and her personality is even better. 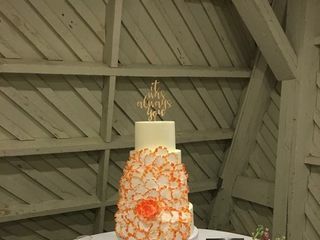 Due to miscommunication, my cake ended up being throwing away at the end of the night, and sadly, my husband, my wedding party and I had not gotten to eat our slices due to everything going on. When Sarah found out about this she offered to make me a smaller cake in the same flavors as my wedding cake. She goes above and beyond for her clients. Look no further for your bakery. Please, please, please contact Sarah with your cake/dessert needs whatever they may be. Sarah is very easy to work with and easily reachable by e-mail or phone! Her cakes are DELICIOUS and gorgeous. She hand makes every cake and hand paints everything. She is a true artist and a master of her craft! She also does cakes for occasions other than weddings. She made my mother's birthday cake one year and everyone was pleased to know she was also making our wedding cake! Look no further for you wedding cake and wedding desserts. She takes your vision and works with it to create a master piece! Our cake was gorgeous and so delicious. It looked exactly how we wanted it too. Sarah was very nice and easy to work with. Definitely recommend her!! Thank you so much Whitney we loved being part of your wedding day! I was extremely happy with my decision to have Fresh Baked to our wedding cake. Sarah did a wonderful job with the tasting and gave us a full sampling of all she could offer. The cake was perfect. Exactly what we ordered and more. We ended up running out of fake flowers for decorations for her to use, but had some leftover fresh ones there and she just ran with it. Looking back I can't believe we were going to use anything but fresh! Fabulous job, thank you very much! Sarah knows her way around fondant. We were thrilled to find her in downtown Roanoke. She was responsive and super-reliable. Her cake is a little on the firmer side but very delicious. Her buttercream fillings are to die for. We had a small wedding and a very small cake shaped like a Tiffany box. Sarah just did a great job. Thank you so much Christine, we had a blast creating your cake! Just wanted to say thank you Sarah for all the work and effort you your staff put into our wedding cake. It was beautiful!!! I almost hated to cut into it :) And it tasted so delicious! I really did not want to share! Keep up the good work and good luck to all of your future endeavors! Next time we are in the Roanoke area, we'll stop in! Thank you so much for this lovely review. We loved being a part of your beautiful wedding at Sundara! Sarah with Fresh Baked made the absolute best wedding cake I have ever had. My husband and I aren't even big cake people and the cakes that we tasted were AMAZING!! Sarah took our vision and went above and beyond expectations to make the absolutely perfect wedding cake. Sarah was great to work with! She was responsive and flexible and was great at providing suggestions on what we needed in terms of numbers and flavors. Most importantly, the cake and cupcakes were delicious on the day of! Would highly recommend! Thank you for your kind words and for taking the time to complete a review. I am so happy you enjoyed your cake experience with Fresh Baked Bakery! Oh my gosh Melissa! You are the sweetest and I was so honored to be part of your wedding day. I wish you and Jason many, many, many years of happiness! Our wedding cake was absolutely beautiful (and super, super, super delicious)! We received so many compliments. Sarah also made the entire ordering/design/delivery process exceptionally easy. My husband and I are both looking forward to stopping in to see her other Fresh Baked cakes super soon. Thank you, Sarah! Amazing! Our cake was so perfect! It was beautiful and looked exactly how I imagined! It's hard to find a cake that is beautiful and delicious, but this girl can do it! Flavors and quality of cake was awesome! Tall cake with icing layers inside. 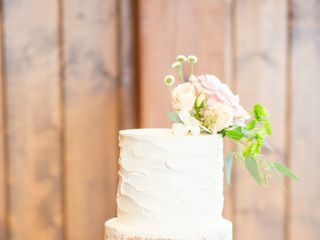 Fresh Baked VA provided us with immediate responses and helped us choose the best cake flavors for our wedding! Sarah provided a tasting and created our cake to our specifications. She delivered the cake safely to Powhatan, VA on those windy roads! I would recommend Fresh Baked VA to anyone who loves cake so much it can't be too sweet because her cake was amazing! Most beautiful, best tasting cake EVER! Sarah has been a joy to work with and made my daughter's wedding day very special. From our first meeting to where we tasted some of the best cake I have ever had, to the day the cake was delivered, Sarah was very professional, helpful, and responsive and one of the nicest people I have ever met! Thank you! I met Sarah at a Bridal Show, I had been to quite a few and tried many different cakes, my brother and sister also got married a yr before I did, so trying cake was nothing new. But as soon as her cake hit my mouth I was in heaven I knew she had to do my cake. Unfortunately I couldn't afford her price with my high budget, so I continued my search. No matter what though my taste buds compared everything to her cakes! So I talked with Sarah told her I could not go without her cake and we came to a great price and enough to feed my guests! I couldn't have been happier with Sarah and her amazing cake! Her response was excellent, she hit the design of the cake spot on, the taste was amazing, and I never saw her the day of and payment was a breeze. The cake was the hit of the night besides the bride! weeks later and I still get asked about my cake not only for the look but the taste! Well worth the price I'd pay it 100 times over! I cant wait for my anniversary to order another cake! Sarah is so amazing at what she does, she made our wedding day even more special with the cake that she made, it was one of the biggest topics of the night. She was able to replicate the exact cake that we found on Pinterest, which was not a simple thing to do. I was simply amazed when I saw the final result. Not only did the cake look beautiful, it tasted just as good and it was honestly the best cake I've ever had. Sarah is very responsive and gets back with you in a timely manner, I would recommend her to anyone who may need a cake done! Sarah was a delight to work with. We had her make cupcakes for us for our wedding and they were a huge hit! It was difficult to pick our favorite flavors after our tasting, but we chose to do two flavors: Lemon Raspberry and White Almond Cake. On top of making the cupcakes she also made a 6" cake for us to cut for ceremonial purposes. Sarah came to our venue which was 45 minutes away and set them up with wonderful artful detail. They lasted outside in the heat for several hours and tasted like they were right out of the oven. Just delicious. Our guests had several of each flavor. I highly recommend working with Sarah for your wedding or next party! Thank you so much for the lovely review, you were a pleasure to work with as well. I am so happy that I was able to be part of your wedding day. Congratulations! Sarah is AMAZING! The wedding cake was a show stopper at my daughter's wedding. Sarah listened to my daughter's requests and delivered! I highly recommend Sarah and Fresh Baked.